62 MMS March 2017 mmsonline.com CNC TECH TALK Columnist CNC programmers dread process and engi- neering changes because they require program changes. The more workpieces involved, the more programs that must be changed. Consider any method change that would affect all of the work- pieces you run on a given machine. How many programs would you need to change to accom- modate this method change? O f c our se, ma jor pro c e s s or e ngine e r ing changes unavoidably will require reprogramming the affected workpieces, especially if those changes require modification of tool paths or machining methods. But with method changes that are minor, and with a little ingenuity, you may be able to handle the issue without having to change a single CNC program. 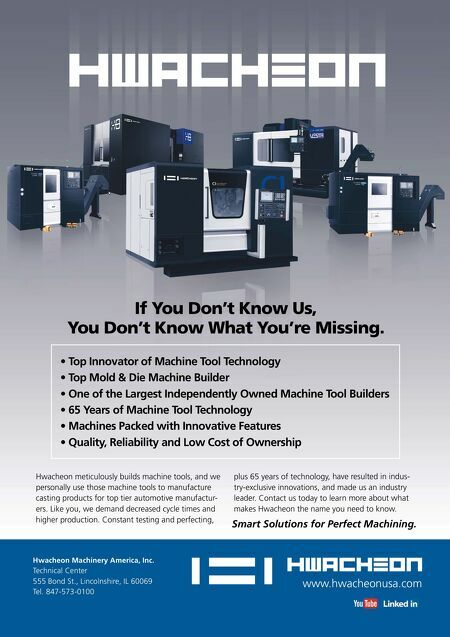 For example, I know of one company that wanted a machining center to execute a set of G10 commands for entering workpiece coordinate system offsets, not just at the beginning of every machining program, but at the beginning of every cutting tool sequence. The work-offset-setting commands are stored in a subprogram: O1000 (Work-offset-setting commands) G90 G10 L2 P1 X-12.2736 Y-8.1127 Z-13.2635 G10 L2 P2 X-15.3766 Y-8.3165 Z-13.3266 G10 L2 P3 X-18.9376 Y-8.3472 Z-13.3887 G10 L2 P4 X-21.1027 Y-8.2716 Z-13.3173 M99 Every time the setup person prepares a new job, he or she measures work offsets and modi- fies program O1000 accordingly. The beginning of every one of the machining programs currently includes a subprogram-calling command: N005 M98 P1000 (Enter work offsets) The method change necessary in this example involves calling the work-of fset-entering sub - program at the beginning of every cutting tool sequence, not just at the beginning of the machin- ing program. (This shop has had operators run from the middle of the program for the first work- piece, skipping the subprogram-calling command, but this caused the machine to use work offset settings from the previous job and could have resulted in a crash.) One way to handle this method change would be to add the subprogram-calling command to the beginning of every tool sequence. However, if an average of 10 cutting tools were to be used in each program, nine program modifications would be required per program. If the company runs 300 programs on the machine, that equates to 2,700 error-prone program modifications. When you are faced with modifying many pro- grams, and especially when program structure is involved, another alternative with FANUC CNCs is user-created G, M and T codes. These may make it possible to modify the way an existing CNC word works in order to achieve the desired result. The solution for the shop in our example was to simply modify the G codes related to setting the workpiece coordinate system (G54-G59). Since the appropriate command for invoking workpiece-coordinate-system offsets was already specified at the beginning of every tool sequence, there was no need to modify any machining pro- grams. 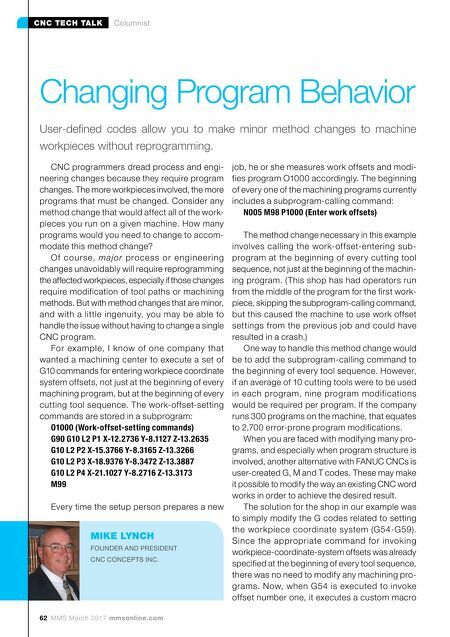 Now, when G54 is executed to invoke offset number one, it executes a custom macro Changing Program Behavior User-defined codes allow you to make minor method changes to machine workpieces without reprogramming. MIKE LYNCH FOUNDER AND PRESIDENT CNC CONCEPTS INC.